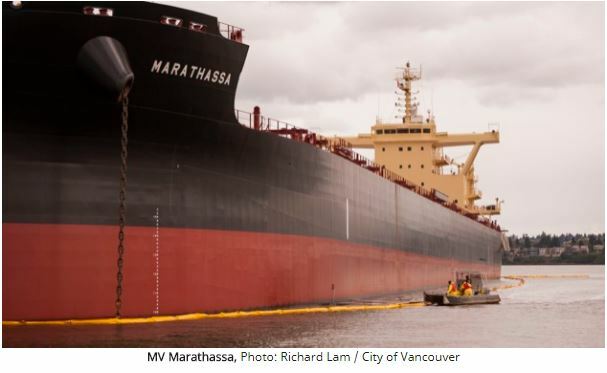 As reported by CTV News, charges have been laid against the owners of the MV Marathassa nearly two years after a leak of bunker fuel fouled the beaches of English Bay in Vancouver, but the company is trying to scuttle the case. Documents filed in British Columbia’s provincial court show the Marathassa and Greece-based Alassia NewShips Management Inc. face a total of 10 charges including discharge of a pollutant, unlawful disposal of a substance and failure to implement an oil pollution emergency plan. The company is also accused of depositing a deleterious substance in a way that may have allowed it to reach waters frequented by fish, as well as depositing a substance harmful to migratory birds. At least 2,700 litres of bunker fuel spilled on April 8, 2015, while the Cypriot-registered vessel was moored in English Bay. The ensuing miscommunication among Canadian authorities and delays in cleanup raised questions about Canada’s preparedness for oil spills at a time when the Trans Mountain pipeline expansion was being hotly debated. A provincial court date has been set for Wednesday, but Alassia is attempting to stop the proceedings with an application for a judicial review filed in Federal Court. The company will ask the Federal Court on Tuesday to stop the provincial court hearing from taking place until a judicial review has been heard. In court documents, it says summonses in the case were invalid because they were served to a Canadian insurance adjuster and a ship captain who has only worked for Alassia on two fixed contracts. Alassia argues that Canadian law requires summonses to be delivered to an executive officer of a corporation or a branch, and that neither the insurance adjuster or the captain fit that description. “This is a serious issue to be tried in that it is doubtful that either attempt to serve the applicant was valid,” the company’s Vancouver-based lawyer Peter Swanson says in court documents. Swanson says the company will suffer “irreparable harm” if the provincial court hearing proceeds as there’s no way for the company to challenge the validity of the summons in provincial court without submitting to its jurisdiction. Alassia is seeking an order declaring the attempt to serve the summons to be invalid, quashing and setting them aside, as well as an order prohibiting further attempts to serve the summons in a similar manner. The company is also seeking costs. In an affidavit, Valakitsis Antonios, the ship captain who was served the summons, says he worked on a vessel associated with Alassia between April 2014 and March 2015, but he was at home in Colombia in April 2015 at the time of the spill. He says he is currently the master of the MV Afroessa, which is owned by Afroessa Shipping Corp., and he has no long-term relationship with Alassia. Eric Renteria, an insurance adjuster at Charles Taylor Adjusting in Vancouver, says in an affidavit that an Environment and Climate Change Canada employee did not explain why he was serving him with a summons. He says he is not employed or otherwise associated with Alassia and hadn’t heard of the company prior to receiving the summons last month. Charles Taylor Adjusting is not a branch of Alassia, he adds. B.C. Environment Minister Mary Polak said Thursday she couldn’t comment on the charges but she was “pleased” the federal government was taking spill response seriously. Alassia declined to discuss the legal proceedings in a statement but thanked all those who assisted in the response.